With the explosion of home inversion therapy, manufacturers are now producing a wide range of sizes and styles of inversion tables to choose from, making it difficult to find a reliable and comfortable inversion table that offers the type of features you’re looking for at a price you can afford. We’ve taken the time to review the top five best inversion tables on the market. Each of which has something special to offer whether it’s a higher than average weight capacity, a more comfortable backrest, and ankle locking system, or a solid frame that’s built to last. It’s our goal to provide you an inside look at what each model has to offer in order to help you find an inversion table that can offer the type of performance and features you’ve been searching for. If you’d like to learn more, we have a great article on how to use inversion tables that details step-by-step, the full inversion process. 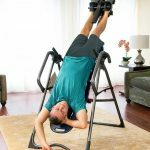 We’ve also included a great guide that discusses inversion table exercises, in the event that you’re looking for new ways to intensify your home workouts. Boasting a higher than average weight capacity, an extra-long ergonomic backrest, and heavily padded ankle lock system, this model is packed with all the features you want and need in an inversion table designed for people suffering from serious back pain. FDA approved, third-party tested, and equipped with a wide range of features, this sturdy inversion table is highly adjustable and perfect for multi-person use. Offering twice the average user weight capacity, this larger than life inversion table is incredibly stable, easy to use, and highly adjustable. Considered a little on the pricey side, this fixed model is definitely not a space saving inversion table, which will make it a poor choice for homeowners and apartment dwellers who are short on space. Introducing another popular model from Teeter, this innovative inversion table has got it all from the patented acupressure nodes, to an innovative ankle locking system, built tough, this versatile table has plenty to offer the chronic back pain sufferer. Deemed one of the easiest inversion tables to use on the market, this popular model comes equipped with the patented iControl feature that makes full inversion a cinch. The Pro Max inversion table by Health Mark features a total of six preset angles, in addition to twenty-five height settings. It also has a higher than average max weight capacity of six hundred pounds. The Pro Max is currently one of the only tables on the market that allows you to face up or down when strapped in. Lying in a facedown position during inversion therapy is said to allow for increased blood circulation and relaxation. The table can also fully invert to one hundred and eighty degrees, also allowing for hyperextension. This model also features rear and front ankle brackets that are easily accessible, a crescent-shaped head and face rest, foam back support, and rolled knee and thigh support. Made from heavy gauge heat treated steel, this tougher than nails inversion table comes with a foam padded back support that’s designed to contour to the user’s body for total comfort. The ankles are supported by padded rear and front rolled ankle supports combined with latch locks and ankle brackets for improved safety. The table features higher than average weight capacity that’s twice the capacity that competing models offer. The table can fully invert at one hundred and eighty degrees using the facedown position for full gravity traction. The crescent-shaped head and face pillow is the same type of pillow found on traditional massage tables. This is a large fixed model that weighs in at one hundred pounds. Because it can’t be moved easily once set up, we don’t recommend this table if you’re tight on space in the home. While the table is equipped with two castors designed to help you move the table from room to room, most buyers reported that moving the table was still very difficult. For the price, we were disappointed that the table only comes with a one year warranty. Best described as comfortable, firm, and easy to use, this inversion table is highly adjustable, sturdy, and suited for larger or heavier users. For some, the Pro Max is a little on the pricey side, but when you consider how much money you can end up saving by enjoying inversion therapy in the comfort of your own home, the price is totally worth it. Teeter is a popular company that’s known for producing medical grade quality inversion tables. 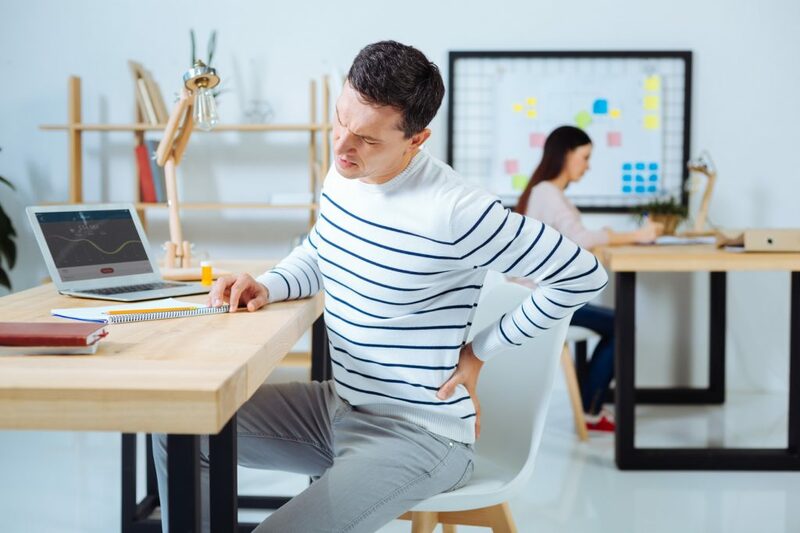 We were excited to take a closer look at this model, once we learned it’s FDA approved and received plenty of positive feedback from buyers who suffered from chronic back pain. The EP560 by Teeter features patented acupressure nodes that have been designed for trigger point release. The backrest’s lumbar bridge complete with an adjustable arch will provide added lower back support. When it comes to ankle lock systems, Teeter has the competition beat. The wrap around ankle cuff design offers an ergonomic fit that promotes longer use per session. The table itself features a contoured flexible design that allows the user to fully invert, comfortably. This table is designed to help reduce pain caused by tension, sciatica, degenerative disc disease, spinal stenosis, herniated discs, and curvature of the spine. This model is FDA approved and Underwriter Labs certified. Buyers will also love the five-year full warranty. One of the easiest to use and safest inversion tables on the market, this model features cam locks, auto-locking hinges, a heat-treated steel frame, and Ergo-Embrace supports. The ankle comfort dial allows you to adjust the height of the foot platform to accommodate larger or smaller feet, making this a great buy if more than one person in the home wants to try inversion therapy. The Ergo-Embrace supports work by surrounding the ankles with a goal of evenly distributing weight around the heels. The safety tether allows you to invert easily, and safely. It’s also highly adjustable. For some, the assembly process was difficult. Many buyers reported that the included instructions were vague and hard to follow. 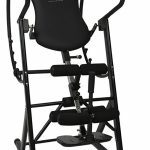 This inversion table is highly adjustable and comes equipped with a variety of features that are focused on user comfort. This table is also one of the only FDA approved inversion tables on the market, so you know it’s a total performer. The Gravity inversion table by Ironman features an impressive max weight capacity of three hundred and fifty pounds, a tubular steel frame, an easy to use ankle lock system complete with ergonomically molded cushions, and a foldable design that’s perfect for the apartment dweller or homeowner who is short on space. The table also features a scratch-resistant, powder coated frame designed for increased durability. The backrest consists of thick memory foam padding, which helps to ensure user comfort during an inversion therapy treatment. Additionally, the extended backrest features a double stitched design that further improves the table’s durability. The removable lumbar pillow is perfect for users who are suffering from chronic lower back pain and in need of additional support. The longer frame design makes this model perfect for taller users up to six feet, six inches tall. Ironman’s patented ankle locking system provides both security and user comfort. The extra-long safety handle will allow users to safely invert without the assistance of another person. The non-skid floor stabilizers prevent the table from sliding around on the floor during use. This table can invert up to one hundred and eighty degrees. The foldable design is a huge selling point for anyone who doesn’t have the space to set up a fixed inversion table. Despite the safety handle attachment, there were still some complaints that the table can be difficult to get in and out of. Others found the ankle locking system to be pretty uncomfortable after inverting for only five to ten minutes. 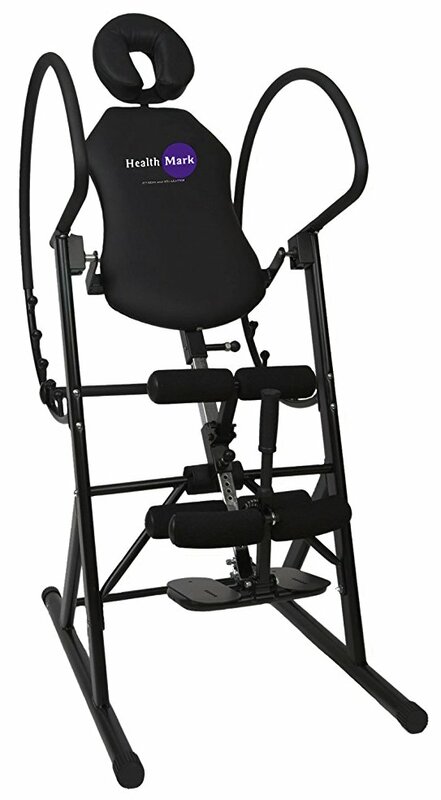 Reasonably priced, built solid, and able to withstand heavy use, combined with the innovative ankle locking system, long safety handle, and ergonomic padding, this inversion table blows the competition away. Easy to use and foldable, the Gravity 4000 is perfect for either inversion therapy or challenging workouts. While in the beginning learning how to invert and manage the ankle locks can be difficult for some, we felt that the table itself was pure quality and a tough model that’s definitely designed with convenience, and comfort in mind. The EP960 inversion table by Teeter is constructed from heavy-gauge steel, weighing in at just seventy-five pounds. It features a foldable design that allows you to easily break it down and store it away when not in use. The Patented Teeter Comfort Trak bed consists of two large pieces that fold together. Hands down, the bed makes this inversion table one of the most comfortable models on the market. The bed flexes with your movements, working to improve comfort during treatment while reducing the pressure placed on the back, even when you aren’t fully inverted. The table’s Stretch Max handles assist users during treatment, making it easy to invert or get back to an upright position. It can also allow you to carry out a variety of stretches, easily, leading to improved stress relief and decompression of the spine. The tether straps further improve your control over the inversion angles using simple arm movements. The table arrives ninety percent pre-assembled, making the rest of the assembly process fast and easy. This model comes with an instructional DVD and owner’s manual. The DVD includes five strengthening and stretching exercise classes. The table features a heavy-duty, sturdy powder coated A-frame base that’s made out of high-quality steel. The table offers a three hundred pound max weight capacity. Very easy to use, this table comes with three preset angles. Buyers will also get a five-year product warranty on all parts. There were some complaints regarding the folding process, which some buyers felt was complicated. Other users claimed that the ankle support system was hard to adjust. 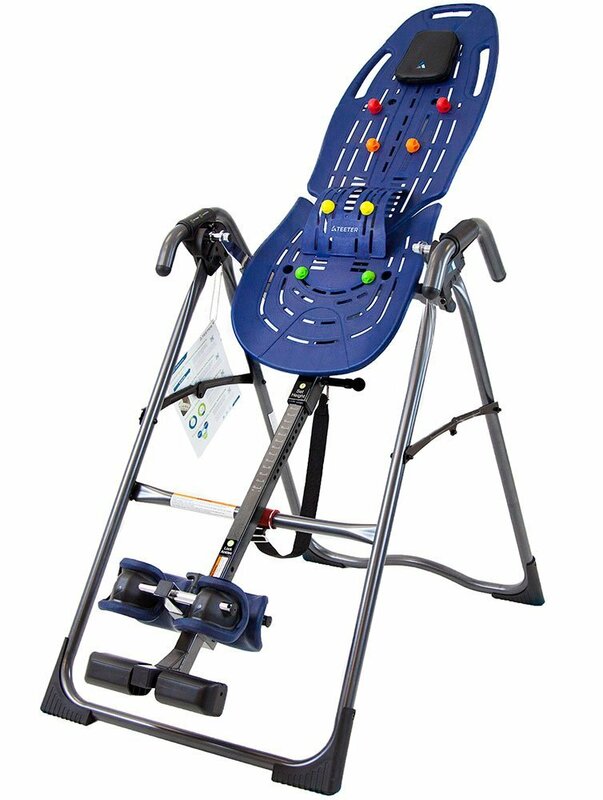 This advanced Teeter inversion table comes with the extended ankle lock system, Stretch Max handles, and the patented acupressure nodes that Teeter inversion tables are known for. The table is foldable, which is a huge selling point if you’re looking for an inversion table that’s easy to fold and store. Overall, this feature-packed inversion table is simple to use and it’s even easier to assemble. For the price, we feel that this table is a total steal. 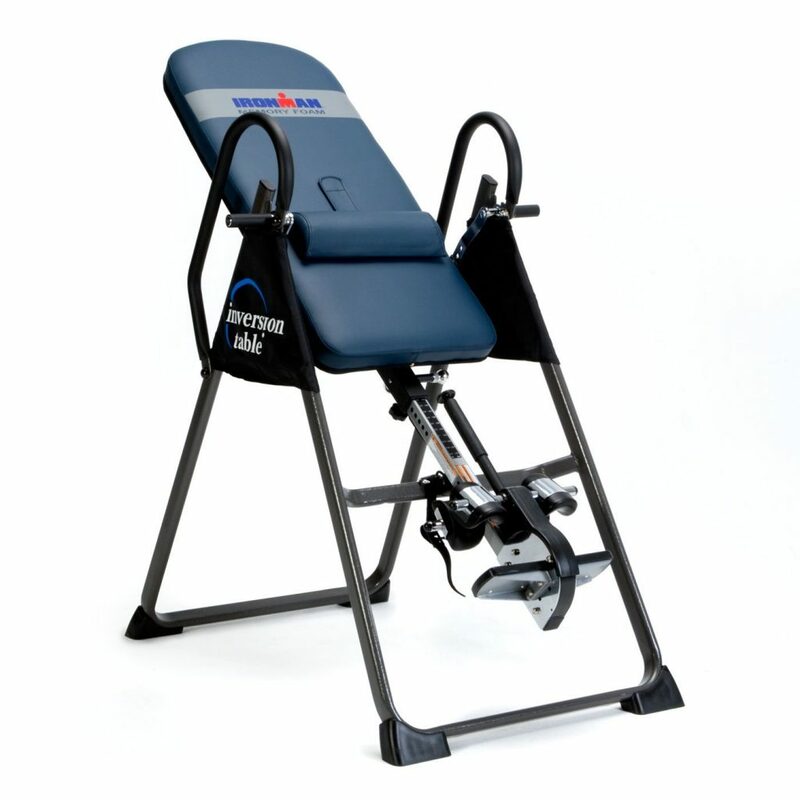 The iControl 400 inversion table by Ironman is one of their top-selling models for a number of reasons. First, it features an extra-thick foam backrest, for total back, head, and neck comfort. The iControl feature will allow you to easily lock the table at one hundred and eighty degrees. This is a foldable inversion table that weighs in at just sixty-six pounds. It has a max weight capacity of two hundred and seventy-five pounds. Made from heavy-duty steel and a powder coated frame that’s scratch resistant, this table is incredibly easy to use and comfortable to boot. The thicker than average foam backrest is topped with a durable vinyl cover and it provides excellent back, head, and neck support. The iControl disk brake system means you won’t have to struggle with a tether to fully invert the table in seconds. It also allows you to lock the backrest in at any desired angle. Due to its compact size when folded, this is the perfect space saving model. The table’s ankle lock system comes with an extended handle that makes locking and unlocking the ankles easy. The ankle holders are contour molded for added user security and comfort. The handlebars are covered in foam and easy to grip. The table also comes with a built-in item holder so you can store personal items such as your phone, keys, and more. There were some complaints regarding the disk brake system. Some buyers reported that they had trouble getting it to lock. If you run into this issue we recommend that you contact customer service. The lower than average max weight capacity was a deal breaker for some. An affordable price for a table that has plenty to offer the chronic back pain sufferer. The iControl system gives beginners every reason to buy an inversion table that’s so simple and easy to use. Perfect for inversion therapy sessions or workouts, this model by Ironman is solidly built, comes with essential features that you won’t find on other inversion tables in this price range, and offers a comfortable backrest and ankle locking system that encourages consistent use. Inversion tables offer a wide range of benefits including pain reduction, improved range of motion, decreased pressure on the spine, and improved posture. With so many choices out there, it can be difficult to find the best inversion table to suit your specific needs. There are plenty of things to consider, such as ease of use, safety, brand options, angle options, and frame quality. 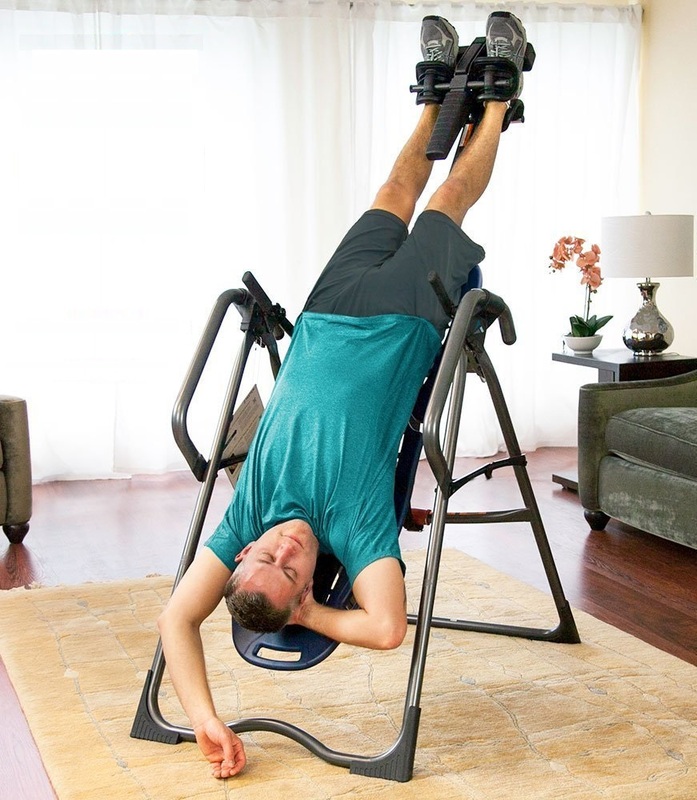 An inversion table is a popular tool used to treat back pain at home, naturally. With the right piece of equipment, you’ll be able to invert comfortably and securely, in order to decompress the spine and relieve pain in just a matter of minutes. 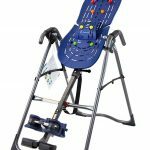 If you’re not sure which type of inversion table is right for you, take a look at our buying guide to get an in-depth look at the important features many of these models offer, and the specs and characteristics to look for when shopping around for the best inversion tables on the market. When it comes to your health and potentially dangerous home treatments, you should make sure that the table you buy is safe and able to provide the type of benefits you can expect from a top of the line model. Take a closer look at each model to check if it’s FDA approved or has been tested by a third party, in order to determine if the table is safe to use. Currently, there are only a few companies that sell tables that have been FDA approved. In terms of third-party certification, this basically involves a stamp of approval from a reputable source that the product in question can in fact perform reliably and safely. There are currently no regulations that mandate manufacturing standards for inversion tables. But there are product safety groups such as Underwriters Laboratories, a third party company that tests products for quality and safety. So when you’re shopping for an inversion table, check if it’s UL certified or FDA approved. What makes it hard to spot a good model from a bad one is the fact that most tables look exactly alike. This is why you have to look closer in order to see what features and specs will truly set these tables apart. An inversion table that looks great on the surface may have been made with cheap materials that can actually compromise user comfort and safety. These are usually the lower priced tables, and they’re priced so low for a reason. The roller hinge is what holds all of the user’s weight, and it’s one of the most important components on a table. Look for roller hinges that are made out of heat-treated, high-quality steel. A hinge should also be designed to withstand a four times safety factor when at max weight capacity. If the table you’re interested in doesn’t meet this basic requirement, then you’re potentially putting yourself at risk. Ergonomic design: The table should consist of an ergonomic design and frame with built-in handholds for advanced decompression and stretching. Ankle locking system: The system should be designed not only for ease of use but for max comfort. Inversion tables that come equipped with an extended handle can make securing your ankles or unlocking them, so much easier. Sturdy frame: Keep your eye out for tables that consist of heat-treated steel, which is the toughest material a table can be made of. These impressively durable frames also allow for a higher weight capacity. Hinges: Auto-locking hinges are a great feature that’s designed to prevent the accidental separation of the base and table during use. Design matters: The table you choose should heavily focus on function, form, and safety. Weight capacity: Pay close attention to a table’s max weight capacity. All models should have this listed on their spec sheet. Failure to stick to the weight capacity can result in a poor functioning table and possibly injury. Assembly: How easy or hard a table is to assemble is important, and for some, a difficult assembly can often be a deal breaker. Balance: How well a model is balanced can either improve or ruin your inversion therapy experience. There are many lower priced models out there that aren’t precisely balanced. A perfectly balanced table gives the user total control of rotation when they’re inverted. For both peace of mind and comfort, look for a major brand that has a reputation for producing quality tables that allow for ultimate control and optimal balance. Slight arm movements should be enough to shift the user’s body weight for total control of both angle and rotation. A high-quality table should consist of an ergonomic design that includes built-in features that can provide the user with maximum benefits. As an example, a completely smooth table can reduce friction while helping the body to slide slightly in order to allow them to fully decompress their spine, which results in the reduction of chronic back pain. Other features such as the popular assist handle, will make it much easier for the user to decompress and stretch, based on their needs. A warranty can give you much-needed peace of mind with this type of important purchase and it’s a good sign that the company believes in and stands behind their products. If you find a model that offers no warranty, this is definitely a sign that the brand isn’t confident that their inversion table is able to perform as it should. Look for models that come with a two to four-year warranty, in addition to in-house customer service. We hope our reviews of the top five models of the best inversion tables on the market have helped you to choose the right model based on your needs and your budget. Each table we have chosen is designed to provide maximum benefits, whether you’re using the table to treat ongoing back pain, spondylosis, sciatica, or you’re looking for a solid table you can use to increase the intensity of your workouts.